It's not that big a leap from the public service work done by community organizers and the pragmatic work of coalition-building done by elected officials. 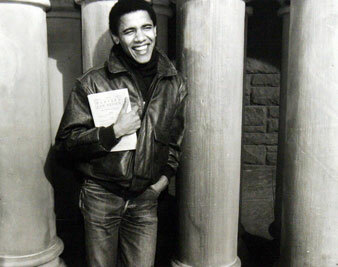 A young Barack Obama during his community organizer days. Before Karen Bass was elected Speaker of the California Assembly–the second-most-powerful job in the nation’s largest state, with over 36 million people–she was a community organizer. Her colleagues selected her for the post earlier this year because during her four years in the legislature she displayed the skills she’d learned as a grassroots activist–identifying key issues, finding solutions, developing strategies to win, mobilizing people and forging coalitions by listening to and finding common ground among people with diverse backgrounds and interests. In fact, Bass, the first African-American woman to serve as California Assembly Speaker, is one of many effective elected officials who began their careers as community organizers. These include the late Senator Paul Wellstone of Minnesota, the late Ed Roybal (California’s first Latino member of Congress, elected in 1963), former mayors Tom Murphy of Pittsburgh and Andrew Young of Atlanta, Bev Stein, former chair of Multnomah County in greater Portland, Oregon, former Connecticut Secretary of State Miles Rapoport, former state legislators Gonzalo Barrientos of Texas and John McDonough of Massachusetts, and the late Sally Shipman, an Austin City Council member. One-time organizers currently serving in public office include, just for starters, US Senator Barbara Milkulski of Maryland, Representatives John Lewis of Georgia, Jan Schakowsky and Danny Davis of Illinois, Raul Grijalva of Arizona, Linda Sanchez of California, and Donna Edwards of Maryland, Washington House of Representatives Speaker Frank Chopp, Los Angeles Mayor Antonio Villaraigosa, New York City Council Speaker Christine C. Quinn, Minnesota Secretary of State Mark Ritchie, state legislators Beth Low of Missouri, Michael Foley of Ohio, Gil Cedillo of California, Tom Hucker of Maryland, Tony Hill of Florida, and Crystal Peoples of New York, Alameda County (California) Supervisor Nate Miley, City Council members Jay Westbrook of Cleveland, Chuck Turner and Sam Yoon of Boston, and Melvin Carter of St. Paul, and San Francisco School Board member Jane Kim. Each of these former organizers know–as do the thousands of people who currently work as organizers for groups trying to improve neighborhoods, schools, workplaces, public health and other issues– organizing is a serious job. Like many politicians, organizers are idealists, but they are also pragmatic. They deal with power, conflict and human lives, typically with people not well served by the regular political system. Their job is to help people channel their frustrations and their hopes in constructive and effective ways. When most organizers get into public office, they give a voice to and help represent the people left out of the political process. Karen Bass is proud of her community organizing experience. As founder and long-time executive director of the Community Coalition in South Los Angeles–an urban area with a population almost half that of Alaska’s 680,000 people–Bass dealt with some of the most difficult problems facing society. The daughter of a mail carrier, and a product of public schools, Bass began organizing as a teenager. At 14, she was a precinct captain for Robert F. Kennedy’s 1968 presidential campaign. In college, she was active in the antiwar movement. While working as a nurse and a physicians assistant, and raising her daughter, she continued her political activism as a volunteer. The Community Coalition recruited teenagers to work on community improvement projects as a way to steer them away from gangs, provide them with opportunities to gain leadership skills and self-confidence and give them an incentive to stay in school and have hope for the future. The group sponsored college tours for inner-city students and counseled them about career and financial aid matters. It trained parents of high schoolers to become informed and active on issues affecting their children, such as school conditions and curriculum. One of its organizing projects was to get LA’s vibrant entertainment industry to train and hire more inner-city youth. The Coalition also spearheaded an efforts to secure $153 million to repair South LA school, which had suffered from years of deferred maintenance, mobilizing students to meet with elected officials and show them the terrible conditions of their schools. The group led a successful fight to reduce the over-concentration of tobacco and alcohol advertising in the area and pressured the major billboard company to pay for replacing the offensive billboards with 120 billboards with an anti-smoking message that displayed the teenagers’ own design. The Community Coalition also worked to clean up vacant buildings and vacant lots, get the city to improve its code enforcement in slum housing, and change zoning laws to rid the area of the over-concentration of liquor stores, which served as magnets for drug-dealing. Bass was acutely aware of growing tensions between LA’s African-American and Korean communities, especially after a Korean storekeeper shot and killed a young black girl. Bass reached out to Korean-American activists, such as Bong Hwan Kim of the Korean Youth and Community Center, and attorney Angela Oh, to find common ground. She built on these relationships after the 1992 civil unrest that shattered the community. During the riots, more than 200 liquor stores–most of them Korean-owned–were burned down. Bass and the Community Coalition organized to prevent the rebuilding of over 150 liquor stores, but she also helped the Korean owners find other businesses that could serve the community. The Coalition supported the development of forty-four new, non-alcohol-related businesses, such as laundromats and grocery stores that did not sell alcohol. Bass also recognized the connection between drug abuse problems and the growing number of broken families that left many children at the mercy of the state’s shattered foster care system, and began organizing families and social agencies to draw attention to the problem. Under Bass’s leadership, the Community Coalition took on other pressing issues, always reaching out to other community groups, churches, labor unions, social service agencies, employers and elected officials to enlarge the circle of collaborative partners. After the 1992 riots, Bass also worked to encourage local foundations, the United Way, businesses and community leaders to invest in grassroots organizing to strengthen community-based groups. As a result, Los Angeles is now ground-zero for successful community organizing around economic and social justice issues. A colorful mosaic of activist groups–among them LA Voice, the Coalition for Economic Survival, Los Angeles Community Action Network, One LA, the Los Angeles Alliance for a New Economy, ACORN, the Southern California Association for NonProfit Housing, East Los Angeles Community Coalition, POWER (People Organized for Westside Renewal), Koreatown Immigrant Workers Alliance, Communities for a Better Environment, SAJE (Strategic Actions for a Just Economy), Esperanza Community Housing, the Coalition for Humane Immigrant Rights, Coalition LA, South Asian Network, Progressive Jewish Alliance and AGENDA–have forged effective coalitions across racial, economic and geographic boundaries that have improved housing, education, environmental and economic conditions in LA, a city of 4 million people. One of the byproducts of this growing network has been the election of many LA grassroots activists to public office in City Hall, the state legislature and Congress. Bass had long worked to catapult other community leaders into public office. After years of resisting, Bass was persuaded by a diverse group of supporters to run for the state Assembly. After thirteen years leading the Community Coalition, she was elected in 2004 to represent an economically varied and ethnically polyglot district that has significant numbers of African-Americans, Latinos, Jews, Koreans and Ethiopians. Once she arrived in Sacramento, she was quickly recruited to serve as majority whip, then majority floor leader and was elevated to Speaker by her colleagues earlier this year. As a strong executive director, Bass left the Community Coalition on a solid financial footing and with a new generation of community leaders that she’d trained to run the organization. During her tenure, the group’s budget increase from slightly over $300,000 to about $3 million, secured from government agencies and more than fifteen private foundations. In her last year, the Community Coalition had about thirty staff members. As a legislator, and now as Speaker, Bass has built coalitions to expand funding for many of the same concerns she battled in the streets of South LA, such as children’s health insurance, public schools and urban parks. She’s been a persistent and effective advocate for foster children, sponsoring an avalanche of bills that reorganized the system while expanding funding for it. She has helped small businesses by cutting red tape, and secured funds for affordable housing and preservation of historic buildings. She has played a key role in negotiations with Gov. Arnold Schwarzenegger over the state budget–the nation’s largest at over $100 billion–and in advocating for a more streamlined and progressive tax system. (In contrast, the budget Sarah Palin manages in Alaska is roughly $6 billion). At the Community Coalition, Bass says, “one of my main goals was to ensure that every voice is heard, especially those from the most vulnerable communities.” As Speaker, she represents her district but also has to have a statewide focus that includes forging coalitions among the eighty assembly members. Bass has won high marks for her legislative leadership and political savvy–the same characteristics that made her an effective community organizer.